Orders are shipped via USPS ground to above address, unless requested otherwise. No handling fee will be charged for orders of 20 or more. ETDA Members interested in purchasing The A to Z Guide should contact info@etdalliance for discounted rates. 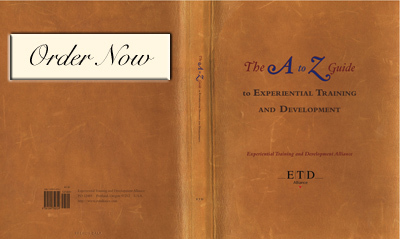 The A to Z Guide of Experiential Training and Development was created to differentiate and articulate the power of experiential training and development services as an extraordinary tool for transforming organizations. Written in collaboration with our members, The A to Z Guide is a declaration of the principles, values, and beliefs that give our work efficacy. In recent years, a proliferation of companies were suddenly leading “corporate team building programs” because they knew how to lead “Ball Toss,” “Corporate Olympics,” and a long list of other games and activities. While those activities have great value in their place, our concern was that they could easily be confused with in-depth experiential training and development services that in the right hands have the power to transform people and organizations. To someone who had not experienced this level of ETD practice, they could appear similar, simply because they both involve activities. Growth, development and transformation are a journey. This guide is a depiction of the landscape that many organizations travel on their way to greater performance and making their visions reality. As with any journey, obstacles will be encountered, the terrain will vary and landmarks will guide the way. The “A to Z” is our travel guide for the journey of organizational transformation – a description of some of the joys and challenges along the way, as well as recommended routes to your destination. To order your copy, please contact info@etdalliance.com.